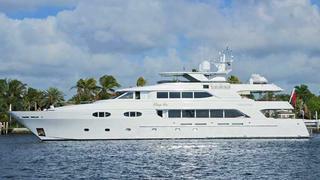 News just in from Mark Elliott at IYC of a $500,000 price cut to the 42m motor yacht Penny Mae. Penny Mae was delivered by Richmond Yachts in 2004 and accommodates 12 guests in a master, VIP, two doubles and two twins. Formerly known as Keri Lee she was taken in trade as part of the sale of Katherine in January, and the owner is keen to sell her quickly. Her asking price is now $14.4 million, down from $14.9 million. She is one of the yachts on display at the FYBA Open House event taking place at the Bahia Mar Yachting Center in Fort Lauderdale today.